Sometimes diversions occur in the kitchen and afterwards, you are thankful for the delightful surprise. This simple, fresh corn salad created just that diversion and now is in our summer side dish line up. Typically, I love Grilling Corn on the Cob, but I decided to boil up some fresh corn that I purchased right from the farmer’s market. There’s nothing better than hot, buttered, summer corn, except on this particular evening, I counted on enjoying it with the family. I waited. It grew cold. They never came home for dinner, and ten ears of corn waited patiently to be devoured. It never happened, and when I woke in the morning, there they sat – the corn, not the teenagers. The teens finally made it to their beds. Now, I don’t know about you, but boiled corn on the cob the day “after” is not very enjoyable, so I decided to salvage it by cutting it off the cob and sauteing it in some butter and olive oil until roasted. I was tempted to dive in, but I decided to put a little summer corn salad spin on it and try something new by tossing in herbs, red onions, vinegar, along with a little salt and pepper to taste. It created a delicious zing in the mouth and even the kids enjoyed it. 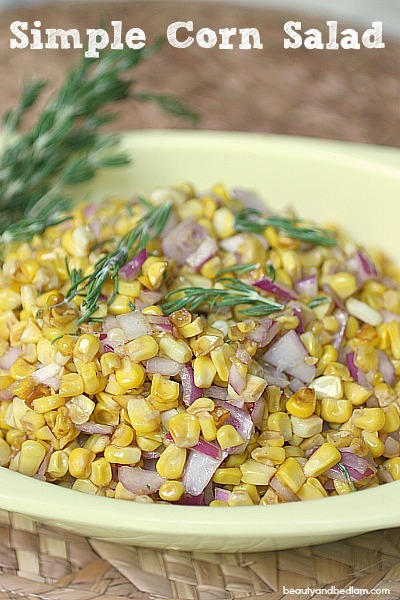 This simple corn salad would be packed with flavor with grilled corn on the cob as well. After you make it the first time, you can then determine how much vinegar you want to add the next time. Add to taste. This would be delicious with additional garden bounty added in such as cherry tomatoes or even summer squash. Summary: This simple five minute corn side salad is fresh, with just a bit of zing. 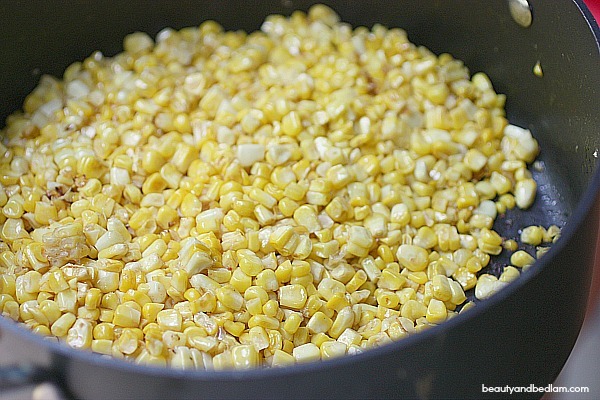 In medium skillet, saute the corn in butter and oil until roasted. 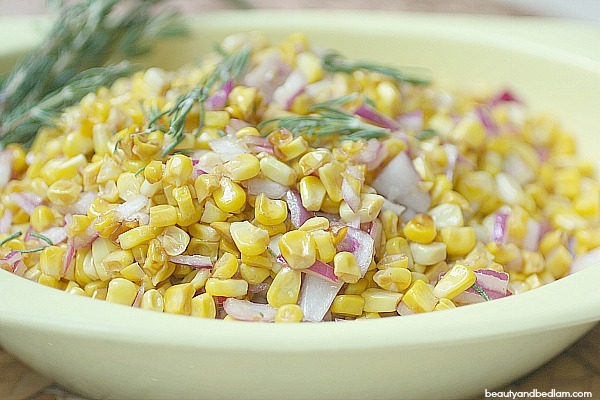 In separate bowl, combine the vinegar, olive oil, chopped onion, herbs and roasted corn. A fun add-in is bacon!!!! So, you just cook up about 6 slices of bacon. Remove it from the pan along with some of the grease. Then, toss in the corn to heat it up in the bacon “leftovers”. Once you’re done w/ all your other ingredients, add in the crumbled up bacon! It’s fab!!! !